ORD 6 J16-15: List of Mechanics Tools for WW2 Dodge Weapons Carriers G502 & G507. 1943 Edition of ORD 7 G502, comprehensive listing of Tools & Equipment listing for most Dodge 3/4 tons (WC/G502). This manual contains a limited number of pictures. Change 1 to ORD 9 G502. No illustrations but includes updated parts listings through July 1948. ORD 9 G502 Complete Illustrated Parts for Dodge 3/4 Ton Truck (T-214). May 1, 1945 Edition. Official US Army parts manual for the Dodge WW2 G502 series of vehicles, including the WC-51, WC-52, WC-53 Carry-All, WC-54 Ambulance, WC-56 Command Car, WC-57 Command Car, WC-60 Emergency Repair, M-6 37mm Gun Carriage and WC-64 Ambulance. CH G502-2 Supplement #2 Parts Listing for Dodge/Boyertown Ambulance. S-8-MA-50-1 & S-7-MA-51. Includes several photographs of the inside of the ambulance and related accessories. SNL G121, Illustrated Parts for M6 Gun Motor Carriage. 37mm (WC55). Dodge 3/4 ton! 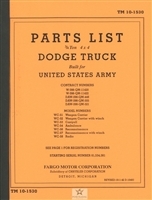 Maintenance Manual for Dodge 3/4 Ton Truck (G502). Dated September 1, 1942. This is a reprint of the official Dodge maintenance manual for the WC-51, WC-52, WC-53, WC-54, WC-56, WC-57 and WC-58 series of 3/4 ton trucks. Everything you need to operate, maintain and rebuild a WW2 Dodge 3/4 Ton. Installation of Radio Equipment in Truck, 3/4 Ton, 4x4, Carryall. This is a high-quality reproduction of the U.S. Army Signal Corps manual of WWII. Dated July 22, 1944. 54 pages on 28. Describes interchangeability of various power train components across trucks including axle shafts, differentials, transfer cases, transmissions and engines. Includes important information of hard to find topics including correcting speedometer readings following conversion. Great reference. Operation and maintenance for the Dodge 3/4 Ton Truck (G502). January 1944 Edition. Covers basic operation, driving controls and routine maintenance including trouble shooting. Excellent pictures of the G502 in various configurations. M6 Gun Motor Carriage. 37mm (WC-55). 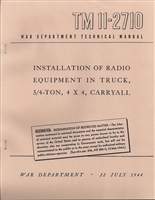 June 1942 edition of original manufacturer's manual. TM 9-750A M6 Gun Motor Carriage. 37mm (WC-55). This manual was produced first by Dodge and then again by the War Department. This is the later War Department version dated November 25, 1942.